Locanda al Colle is placed on a gentle hill and affords a panoramic view of the pretty town Camaiore (about 4 km away), and the beautiful sea of Versilia. The nearest beach is “Spiaggia di Focette”, easily reached in 10 minutes by car. The surrounded landscape allows guests not only to breathe the sea breeze, but also to enjoy the fragrances and colors of the garden where you can find many aromatic and ornamental plants. Camaiore, located in the south-west of the Apuan Alps and in the east side of Versilia, is a great destination for both a relaxing holiday and if you are looking for a strategic position in order to take part in the several music events of the province. 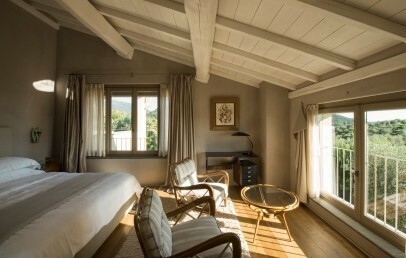 Charm and elegance are the adjectives that mainly describe the Locanda al Colle, a guest house created through the restoration of an ancient country house. The ancient and fascinating atmosphere is still alive in all its rooms and common areas. 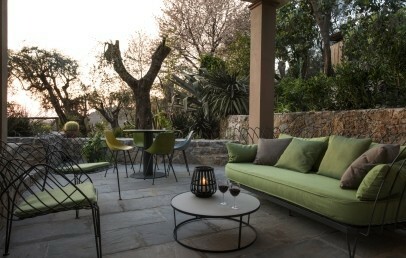 The Locanda features a refined style and a successful mix of past and modern furniture. 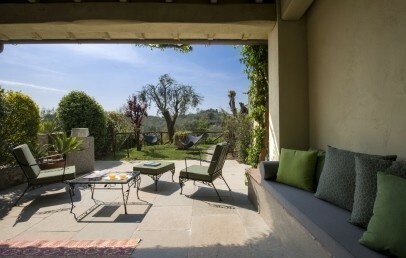 The Locanda del Colle consists of 12 rooms, a bright breakfast room and a relaxing terrace with olive groves and garden view. The outdoor has a salt and heated swimming pool (15x4 m) with solarium, a Jacuzzi and a heated mini pool for 4 people located in the olive grove in a panoramic position. The rooms and suites are unique spaces where nothing is left to chance. They have in common a refined style and present details of art decò of the 1920's and vintage design up to 1970's. The atmosphere is intimate and the privacy is guaranteed. 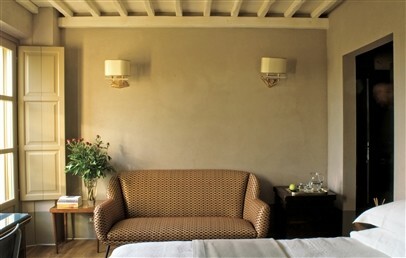 In each floor of the villa there is a cosy living room, a meeting points for guests. Standard – double room with king-size bed and en-suite bathroom with a shower. Superior – double room with king-size bed and 3rd extra bed, en-suite bathroom with a shower or shower/bathtub, hills and seaside view. Superior Garden – double bedroom with king-size bed, en-suite bathroom with a shower (suitable for disabled person), private terrace with hills view. Deluxe – located on the second floor, double room with a king-size bed, bathroom with shower and bathtub, terrace with view over the hills or Apuan Alps, soma have a fireplace. 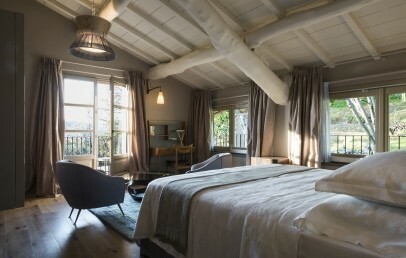 Junior Suite – four-poster king-size bed, bathroom with shower and bathtub, private veranda with garden view. 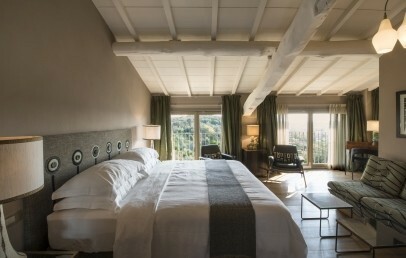 Suite – located on the first floor, king-size bed and one of the Suite has the possibility to add a 3rd bed, living room with fireplace, one or two bathrooms with shower and bathtub, private terrace. The closest beach to Locanda al Colle is “Spiaggia di Focette”, located 10 minutes away by car (5 km). At guest disposal the free beach service (with beach towels included) at Bagno Cavallone, available only from May to September. 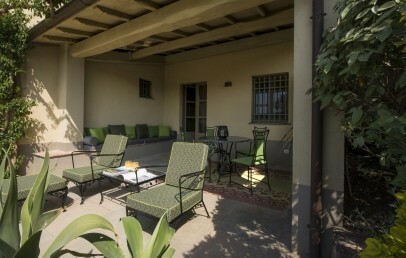 The Locanda has a heated outdoor pool with solarium. The Locanda provides a rich breakfast. Only on request light lunches (first dishes or salads) and dinners (cheeses and salami platter). On Mondays, Wednesdays and Saturdays evenings, guests can taste the light dinner with soups and "bruschette", prepared and served in the warm intimacy of the open-space kitchen. The Locanda al Colle has a private free parking available for all clients and if wished the staff is glad to organize following additional services: massages, cooking classes, wine tasting, mountain bike and scooter rentals, Yoga lessons, a guided visit at the quarry of marble stone or a visit at the studio of an artist in “Pietrasante”. Furthermore following interesting and cultural Events should be seen: the festival “la Versiliana” in the pine forest of “Villa a Marina di Pietrasanta”; the summer festival concerts in “Piazza Napoleone” in Lucca; “Anima Mundi” – sacred music concerts in the Cathedral of Pisa; the festival “Pucciniano” at the open air theater on the lake at “Massaciuccoli a Torre del Lago”; concerts and musicals at the citadel during the carnival in “Viareggio”. A double room called “Orizzonte” characterized by warm shades of yellow and green that enhance the elegance of the furniture. The en-suite bathroom has a large rain shower. 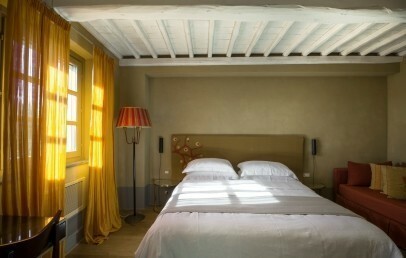 The Superior rooms are called "Olivo", "Noce", "Colletto" and "Cipresso". They differ in colours and nuances, but all feature elegant furniture and refined details. 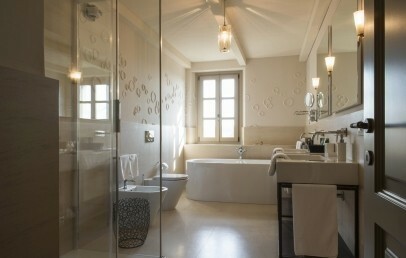 The en-suite bathroom has a large rain shower or a shower-tub. 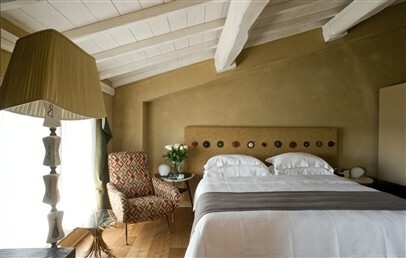 The Superior rooms are sea side and have a hills or olive grove view. This Superior Garden room is located on the ground floor, it is a spacious double room characterized by the fragrances and colors of the many aromatic and ornamental plants of the garden. It features elegant furniture and has a private terrace with hills view. The en-suite bathroom with rain shower is suitable also for guests with wheelchair. 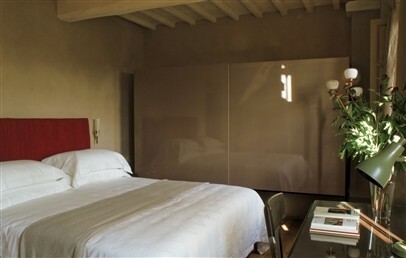 Refined and spacious double room and some have an ancient fireplace. 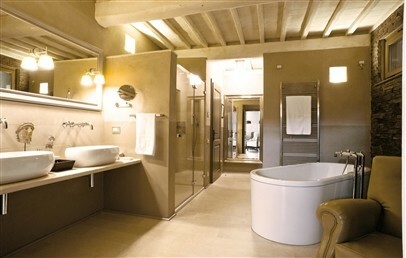 The en-suite bathroom has a large rainfall shower and a bathtub. 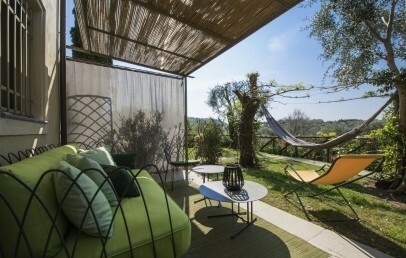 The Deluxe rooms offer a terrace with splendid view over the hills or on the Apuan Alps. 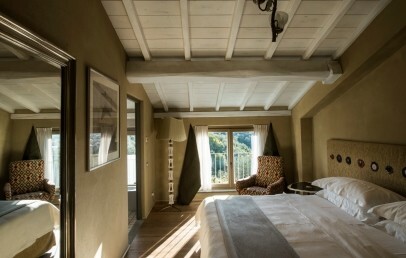 “Alba” is the large Junior Suite of the Locanda. 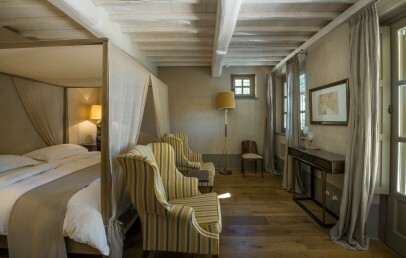 It is characterized by golden and brown colors which create a good contrast with the white linen of the four-poster bed. 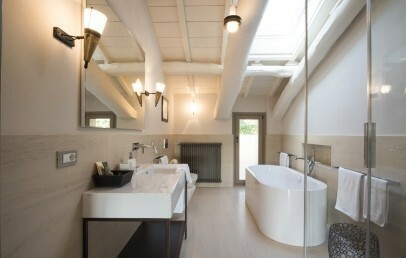 The en-suite bathroom shows a stone wall and offers a bathtub for two. 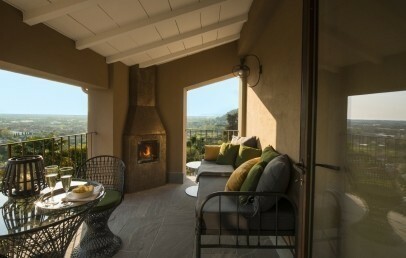 The Junior Suite has a private veranda with garden view. 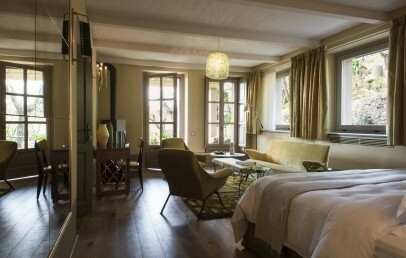 The Suites have a bedroom and living area with classic and modern furniture. Some have a four-poster bed a living room with fireplace. The comfortable Suites have either one bathroom with shower and separate tub or two bathrooms, one with shower and the other with tub. All have a lovely terrace with panoramic view, perfect for relaxing moments.